The Bw Katajanokka is situated in the heart of the city of Helsinki, and is moments away from the city center and marketplaces. This convenient location places the property a short distance from many of the area’s renowned attractions. The Best Western Katajanokka is only 10.6 miles from Helsinki-Vantaa Airport. 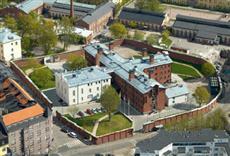 One hundred six comfortable rooms and suites are available in the Best Western Premier Hotel Katajanokka. Each room is equipped with modern facilities in order to ensure each guest is more comfortable during their stay. Specially designed rooms are available for disabled guests. Guests looking to enjoy a delicious meal in an intimate atmosphere can head to the Best Western Premier Hotel Katajanokka Helsinki’s on-site restaurant, which serves international cuisine and refreshing drinks. Business travelers wishing to hold a meeting in the city can make use of the hotel’s conference facilities, which can accommodate up to 130 guests, and can continue their work in the well-appointed business center. After a busy day of working or exploring, guests can work out in the fitness center or head to the spa for a soothing massage.